NOTE: The above is the first panel of an interactive comic. For a collection of images that appear in this comic, see 1350: Lorenz/Images. These will also be described below under themes. Also note that the order of the options are random. Let's see if BSD is any easier to install nowadays. Where only four can be shown - this means there are 5*4*3*2 = 120 different permutations of the way the options can be arranged only in this first image. So the above image will only appear with these four options in this order in less than 1% of the cases! Of course when you choose an option it is indifferent what the order of the other options was. This was the fifth April fools' comic released by Randall. The previous fools comic was 1193: Externalities from Monday April 1st 2013. The next was 1506: xkcloud released on Wednesday April 1st 2015. This comics was posted a day earlier than normal (on Tuesday instead of Wednesday) to honor April Fools' Day of 2014. It is an interactive and dynamic comic with the first picture shown on top of this page, with a possible combination of text options to choose from (see above). The picture is always the same but the order of the four sentences is chosen randomly (and there can be more than four). The result of all the interactions by the readers led to the generation of crowd-sourced content. The title 'Lorenz' is referring to Edward Norton Lorenz who, among other subjects, was famous for Chaos theory and the Butterfly effect (mentioned later in the title text of 1519: Venus). This comic is an example of a Choose Your Own Adventure story as mentioned in the title text. The title text is also a reference to how the story line of this comic will be chaotic by nature, since it includes all of the user submitted dialogue and updates over time based on statistics of user clicks. In this manner, it is a reference to the butterfly effect, a phrase coined by Edward Lorenz to describe how a small initial change can lead to wide variations in outcome in a chaotic system. Every time a story comes to a point where the user can either choose something or contribute when asked to Suggest a line then a link will appear by hovering the mouse over the bottom right corner of the last image. This is named a permalink as it is a link that will recreate this particular story up to the point, making it permanent. It will not save the options listed below that image (i.e. the order of these will change, new options may appear, either because more than four is already present or new will be added and some options may even disappear). An option is thus only saved by choosing it and then saving the next permalink - see more below. The best way to enjoy this comic is to try it yourself! If you didn't do that already, reading any below will spoil you from truly enjoying the comic, and maybe make some interesting discoveries yourself! So here is a spoiler alert if you read on. If you do then see also the section below about Functionality and bugs. Any particular story-line will typically only have one or two of the many themes possible in the comic, but some very long stories may have several, see the Record section below. 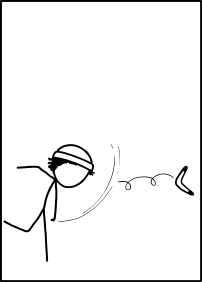 Several of the themes refer to previous comics or generally recurring themes in xkcd. Most obviously is the blowtorch theme which is a direct reference to the previous comic 1349: Shouldn't Be Hard where the last comment is I'll find a blowtorch as a response to Cueball's frustration over his problems. Because it is not always ending "as well" as with a burnt PC, they might instead end up in a shark infested ocean - see the Ocean theme, which is a direct reference to 349: Success, a comic that came exactly 1000 comics before the other one referenced in the same computer problem theme. 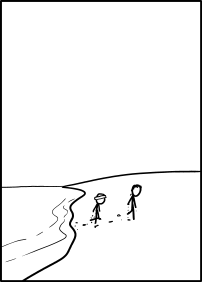 In that comic the sharks had not appeared yet, but here there may be several, and sharks is also a recurring topic in xkcd. These issues with computers is generally a reference to the computer problems themes that precedes both the burning of the laptop and the ocean story-lines, because Knit Cap Girl, the new character from the first image, tries to install BSD, and then when it fails she takes her friend Hairy with her in the fall, in the water, into space or into a Pokémon fight etc. as they are the two main character of this comic. Also Cueball (as a politician vs. another politician with hair) and White Hat has small appearances, but only in a small sections of particular story-line. Only few others interact directly with the main characters in the rest of the possible stories. 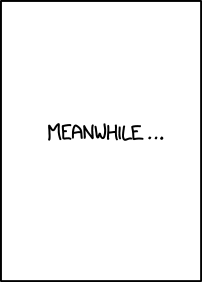 Other themes that are recurring in xkcd is Politics, Pokémon, Boomerangs and Dinosaurs. Dinosaurs enter the comic in the form of the green talking T-rex from Dinosaur Comics, a clip-art-based webcomic that uses the same artwork with different captions for every strip. This particular Dinosaur Comics has a title text that actually refer to Randall and xkcd, and the comic has previously appeared on xkcd in 145: Parody Week: Dinosaur Comics. A way to combine more than one story line is to let characters wake up from a dream or a nightmare, as can be see in the Dreams theme, and dreams is also a recurring topic. Here it can even get recursive so there can be dreams within dreams. One of the way to wake from a dream is of course by encountering a dinosaur that tries to step on your house (with you inside), but another is in reference to the possible rocket trip that may take the characters into space. See the Space theme another recurring topic. There are a few other topics that are covered by Randall himself, but many others will be referenced in the text in the comic. However, since most of the options the users have is created by user input, including naming the characters different names, then any reference made by the text, is not considered part of Randall's work, and will only sporadically be mentioned below under the themes section, and not be included as a category. Here is an example with a permalink where the last comment, in the ocean with a shark, references Malaysia Airlines Flight 370 that disappeared less than a month before this comic was released and has still to been found two years later. But this is a user input not Randall's. Some of the idea of this comic was used again in the next year's April Fools' comic 1506: xkcloud, where user input also generated a very complex comic and the concept of permalink was used again. a Hurry! We're in talks with Facebook. b These stupid tiles... I'll just play one more game. d Oh. Hey. There's some kind of political thing going on. The reader is initially presented with only one panel where Knit Cap Girl is sitting in front of her computer. The reader is given multiple choices concerning what exactly Knit Cap Girl is thinking. Upon choosing any option - the chosen text will appear where her gray speech bubble was (and this will then disappear), and then a second panel appears to the right, to give continuity to the story. Each new panel may have a new set of options or just the button "Continue" to see the next panel without making any choice in particular. Eventually, one may reach a dead end in which the story is interrupted and reader is presented with a text box to suggest how it should continue. Some of the suggestions given should eventually become available as new options. A guy with a knit cap can be seen in 1037: Umwelt in the aurora story line. A guy with knit cap can be seen on a boat in 1110: Click and Drag. A guy looking very similar to Knit Cap Girl, even starting in the same position in front of a laptop, can be seen in 1112: Think Logically. He is described as guy in a knit hat in the official transcript. Randall's wife is depicted with a knit cap in 1141: Two Years, one she uses due to chemotherapy treatments causing her to lose her hair. Since it is clear that Knit Cap Girl has hair, she does not wear the cap for that reason. Two guys wear knit caps in 1321: Cold. They are called winter hats in the official transcript. One of the user pictures for the April fools' comic the year after, 1506: xkcloud, also looked like Knit Cap Girl. At the top of the huge chart in 1732: Earth Temperature Timeline a guy with a white knit cap similar to the one in 1321: Cold is freezing. What appears to be a guy in a knit cap is out watching birds with Cueball in 1826: Birdwatching. In this comic the knit cap is not even mentioned in the official transcript! The knit caps that appeared in 1190: Time are traditionally referred to as "beanies"; by extension, the people wearing them are known as "Beanies" (and their language as "Beanish"). Obviously knit cap is the name that fits best with the three different official transcripts versions mentioned above. Normally, there is a total of 4 options to make: a/b/c/d. Their order changes constantly. Sometimes, there are 3 or fewer options, with the text box to suggest an alternative option. Sometimes, a given panel actually has 5 or more available options, although even in this case only 4 options appear at a time. Refreshing the comic changes randomly which of the available options are visible and which are hidden. As of late April 2014, the existence of 5 options seems to occur only in a few rare cases, including the first panel itself. There are no longer any panels that seem to have six options. It appeared that new panels were generated by Randall in near real time as user suggestions to dialog were submitted around the release of the comic. This April Fools' Day comic has a dynamic panel structure along the lines of a choose-your-own-adventure format - the viewer is presented with up to 4 options for each bit of dialogue, with each choice opening up a new subtree of potential options for the next bit of dialog, and new panel images are chosen semi-randomly based on a graph of potential panel transitions. Readers were also invited to submit dialog options for trees where there were not yet 4 fixed options, thus growing the potential story space. As such there is no fixed transcript for this comic. The dialog options could be based on click-through rates and hence will change over time based on which choices are clicked most using A/B measurement techniques. This will mean that the most popular choices for dialog lines will prevail as the statistics build up. In some cases, dialog line options do not depend on the continuity of the storyline followed, suggesting that some parts of the story are planned. For example, several of the story lines involve one of the two main characters waking up and for instance telling the other character, "I had the strangest dream…" or even reliving the dream. This may be due to common submissions across story lines. Of course there is the other option that Randall has used the first week of April to look though some input and choose himself. These possibilities are not mutually exclusive. Some of the options that were there very early were in quite poor English. Later the same idea was still there but in a more refined sentence. However, after the first week or two, no new panels seemed to appear, which suggests that some were drawn to match the story's progression. A "permalink" is a portmanteau, of "permanent-link". Each panel has a "permalink" button which generates a unique URL for all the choices made by the reader — so a reader can save the chosen choices to compare them to other ways going through the selections. The permalink do only save the chosen options, not the order or the visible options in the image where the permalink is recorded. So it is not possible to save a copy where the options are in the same order as they are in the 1/120 version shown at the top. Also if you go back in the story from a permalink, you can risk, when passing back through a panel with five options, that the option you just got back from, is no longer available, as it is the option randomly not shown this time. Some times it is possible to add your own suggestions in a panel where there are still other choices. But if not before, then the story will always reach a "final" panel (dead-end) where the reader only has the option left to "suggest a line..." By doing so and pressing enter this text is then shown in the speech bubble. But these suggestions can't be saved as there are no permalink button after this. The reader has to do a screen shot by himself - if he wishes to save his own witty remark. As a few weeks had progressed there were probably so few new suggestions that Randall stopped changing the comic. A few images have been found month (or even more than a year) after the release, but there has been no reason to believe that Randall continued to make new panels after the first few weeks of April. But maybe he returns and do one once in a while. For certain the options and text continue to evolve. In the first week after the comic was released, if a response led to a panel where two characters speak at the same time, it was impossible to proceed past the first speech bubble. This was subsequently fixed. As a consequence of these bugs many readers had trouble understanding how this interactive comic worked. Preferably there should be permalink that shows all the possible images below. But sadly this is not the case, as many images are no longer accessible by "playing" the comic game. Only if someone saved a permalink in the beginning of the comics "life" will it be possible to see examples of all images in a story line. If you do have some of these old permalinks saved, please fill in for any missing images here below. There are also notices in the relevant sections, which have no all been streamlined so they are build up in the same way and with as many permalink as are available at the moment. The 17 themes below have been split up after what type of images appear in the comic. At present (April 2016) there are 149 different images, which are all described here below. To see all images go to 1350: Lorenz/Images. Below several images have been used in more than one theme, and there will thus be more than 149 images displayed in the tables below. To avoid this section becomes extremely long all the tables under each section has been collapsed, and can be opened by clicking the link [show]. Permalinks has been provided (where possible) to story-lines that includes all the images shown in a given section. As the story may continue to evolve there may eventually be added more images, although there is reason to believe that this will no longer happen. But if any are discovered please include them in the table below with a permalink. In general only little mention will be of the user contributed text. But if a story seems to evolve around the choices this may be mentioned. Try only to make reference to anything that can be backed up with a permalink. This is the opening image shown at the top of the explanation. Knit Cap Girl sits at her laptop saying something either to herself or maybe to Hairy. You choose what she says from four options written below the panel and thus starts this interactive and dynamic comic. Originally on April the 1st there where only four choices, but this quickly increased to six, but eventually ended up on five options. But you always only have four options to choose from when you begin. By reloading the page you will eventually get the fifth also. Knit Cap Girls with question marks. Knit Cap Girl's laptop has an unspecified problem. Hairy walks in and they attempt to fix it by connecting his laptop with hers. It doesn't work so now Knit Cap Girl tries to write something on Hairy's laptop from a paper (a manual?) she holds in her hand. See this example with all the images shown in this section, including the blow torch option mentioned below). When Knit Cap Girls manual fails the story continues with the blowtorch scene, see below. Knit Cap Girls fails so badly that they both end up randomly floating in the ocean (with or without circling sharks - a reference to 349: Success), see below. Knit Cap Girl tries to write something on Hairy's laptop from a note (manual?) she has in her hand while Hairy watches. 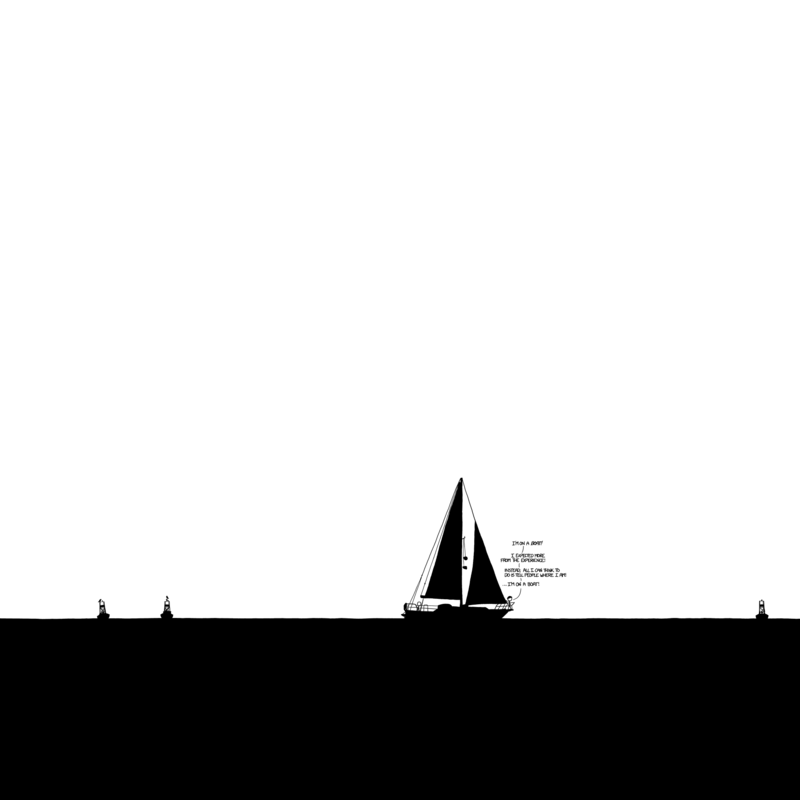 This image is the last in the computer problem theme above and can also lead to the Ocean scene below. A clear reference to the comic from the day before this one: 1349: Shouldn't Be Hard. After this they walk out of the building. See this example with all images shown here, the one also used above for the Computer problems. See this example where the burning first takes place after a dream after a rocket launch. This image is the last in the computer problem theme above and can also lead to the Blowtorch scene above. Usually they get to this point directly from the starting point, but the story can also return here after a dream. Knit Cap Girl and Hairy are floating in the ocean, with or without sharks. A clear reference to 349: Success. Sharks have also been the subject of several other comics. Three giant squids appear and a lone shark seems disturbed. Maybe the squids killed the sharks leaving the blood in the last of these images? Knit Cap Girl and Hairy starts to swim out of the shark free ocean. Finally reaches a beach - see 349: Success again. Here is an example where they reach the beach and walk on. Knit Cap Girl uses her laptop to watch a debate online. The images that follows are what she sees on her screen. See this example where they even leave the laptop afterwards. An online debate between two politicians, one with hair to the left and Cueball to the right is shown on Knit Cap Girls laptop screen. The subject and the actual conversation of which varies according to the storyline. But it always begins with the hairy politician speaking and then Cueball replying. 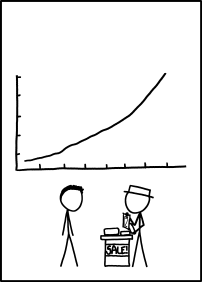 A clear reference to Star Wars which has been referenced often in xkcd. All images used in this section are shown in the above examples. Subjects debated is most likely user suggestions and so any references made is not from Randall even though they have been used in xkcd before. The hairy politician accuses Cueball of having never liked Firefly see this example). The hairy politician vows to end the "war on Christmas" if elected (see this example). The hairy politician praises his adversary and supports his economic plan (see this example). The hairy politician questions Cueball's project of tying multiple birds to a car as fuel replacement, which would require some method to make the birds take off in unison. This is a reference to Monty Python and the Holy Grail where two swallows tied together to a coconut with a string try to lift it. Opening and closing an umbrella near them (a reference to Indiana Jones and the Last Crusade). (see this example). Using a predatory bird to the car to scare them (see this example). Putting resources in the hands of bird educators for the purpose of training them (see this example). Employing fiscal hawks. (see this example). If the hairy politician points out some problem with the reasoning, often the solution proposed by Cueball would be doing the same in a larger scale or saying he completely agrees with everything the other says... (see some of the above examples). Hairy walks in to Knit Cap Girl and points out something happening near which may or may not involve birds (or whatever was the subject). This could be a direct result of Cueball's project. But all this is most likely based on user input! Knit Cap Girl wakes up as it turns out it was just a bad dream (see Dreams below). Both of these last two images have also been used in other story lines. The green T-rex from Dinosaur Comics, (a clip-art-based webcomic that uses the same artwork with different captions for every strip), interrupts the story and proceeds to talk about his tiny arms or other subjects. See this particular Dinosaur Comics where the title text actually refer to Randall and xkcd. See this example with only these three T-rex images. The entire Dinosaur Comics was parodied in 145: Parody Week: Dinosaur Comics, where Randall copied the drawings himself, and T-Rex has appeared in 1452: Jurassic World, where it was the last image from the actual comic that was used, as opposed to the three first here. In the end, the dinosaur stamps on the house where the main characters are inside Knit Cap Girl covering and Hairy escaping. This is thus Randall's own picture but with the foot, seemingly taken from the T-rex, scaling it up to fit the size. Usually the dinosaur story gets to this point before the characters leaves the building. The explanation for this (apart from that it looks like this in Dinosaur Comics) is that whenever the story gets this far one of the characters will wake up from a dream. See more under the dream theme. See this example where Hair wakes up. The characters has thus left the other building first, but then again both buildings turned out to be part of a dream. In some storylines the two characters leaves the building. Or with a fused laptop (see the Blowtorch theme). See this example where they leave the house twice, once first with the laptop intact and secondly after burning it. Sometimes nothing is outside the building except the pavement they walk upon there is just an empty lawn. See this example where the laptop is burned. From this point they will continue walking past different landscapes - see the Walking theme. Sometimes there is a space rocket on the lawn outside the building. See the rocket launch theme. See this example with the computer intact and no political debate. Sometimes there is a huge hole in the ground just outside of the building. The two characters always end up falling into it and one of them awakes from a nightmare - see more below about dreams. See this example with the computer intact after political debate. A walk can begin in more than one way. The most direct way to start the walk is when the two characters are leaving the building, and finding noting out on the lawn. A walk can also start when they leave the Pikachu from the Pokémon theme. See this example where the first walking together image appear after the house and a new walk begins after Pikachu with both the passing images. A walk can also start when they leave the beach after the ocean theme. See this example and this example where respectively a walking together and a passing image appear after they come out of the ocean. In the examples above Knit Cap Girl and Hairy are in principle always walking together. But such a walk can start directly with a zoom in on one of the characters thinking. See this example where leaving the house is replaced with Knit Cap Girl thinking and then finding Pikachu. As it turns out she was still with Hairy and they continue the walk together after, but if the story stops before the last Pikachu picture, it would not be clear that Hairy was still there. But one of them sometimes ends up walking alone even though they started walking together. This happens after they have an argument. Example of this is missing! After Knit Cap Girl runs away from hitting something with the boomerang or is hit herself by the boomerang. See this example where she runs away. See this example where she hits herself. After the meanwhile image where Hairys alone walk can begin. So the walking images from below can also appear or re-appear in other ways longer into a complicated story, as with the Pokémon example above with two walks one early one later. There are also two images which zoom in on one of the characters thinking. This mainly happens for Knit Cap Girl when they are together? But can also happen when she is alone as seen in this example. This only seems to happen for Hairy when he walks alone? A tree where the two are walking past, and only Hairy speaks. See this example where they get past..
A gap/pit in the ground which Knit Cap Girl jumps over, much like in a pit from Mario brothers, while Hairy looks down speaking. See also this example with both images at the end. The two characters are seen walking together from different perspectives. See this example with all three walking together images. See this example with the image with Hairy in front. See this example with Hairy behind. See this example with the silhouette image. See also this example where she thinks twice on the same walk. See also this example where she thinks two images in a row. This image can also appear while she walks alone. See below. Knit Cap Girl walks alone. She is seen walking alone in many different poses and perspectives. There also exist an image with a zoom in of her head showing she is thinking. See this example where she is walking alone and then the thinking image comes at the very end. This image has mainly been used while she is walking with Hairy, see above. In this example seven of the images from this section is used, only the last normal walking image above those with birds as well as those two with birds are missing. At some point a bird passes over her carrying a parcel. It then returns - now with a money note in its beak. The remaiing three images are shown here. The birds could be a reference to Amazon's plans for using drones to deliver packages. Something referred to later, for instance in 1523: Microdrones. In the example the text is a reference to Monty Python and the Holy Grail where it is discussed if two swallows could carry a coconut to explain their precense in England. The picture of the bird with parcel can be seen in this example and this example at the very end. The picture of the bird with money can be seen in this example and this example at the very end. In this example the story continues after the bird with the parcel. In this example the bird with the parcel comes twice. In this example the bird with the parcel is shown twice in a row. In this example the bird with the money is shown twice in a row. The image where she is standing without saying anything, may only be seen in the boomerang theme? That image will thus (so far) not be shown here. Hairy is seen walking alone. He is seen walking alone in two poses. At one point a zoom in of his head shows he is thinking - this does not have to be while alone! In one story line the meanwhile image appears before this walk. See this example with the first four images from this section. It seems that this image only appear before Hairy's alone walk? There still misses an example with the silhouette images of Hairy alone. Knit Cap Girl and Hairy begins an argument. See this example with only the start of the fight. Then either she or he leaves the other by walking back the way they came. See this example where Knit Cap Girl is walking away. See this example where Hairy is walking away. After this either of them can continue the walk alone. Examples are missing... for both walking along - i.e. a story-line that actually shows that at least one of them can continues to walk alone afterwards. The following examples show where these images lead to the first argument image. There are likely more from the walking range of images. It seems like it is the pictures Pikachu which represent the enemy who uses the moves described below. But when they are effective it is that very Pokémon which faints. This seems counterintuitive. How can this be understood by someone who never played Pokémon, or does it also not make any sense for those who knows? Please explain at the first image below. Some of the story-lines involve Pokémon-battles featuring Pikachu, a very popular Pokémon. 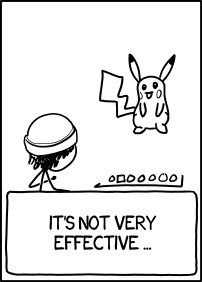 Pokémon has often been featured in xkcd. The battles are drawn in the style of the video games. Although some elements are missing, such as the level, gender and HP bar. In this first image Pikachu the wild pokémon appears. Pikachu is the reason no fight begins in 1516: Win by Induction. It can for certain happen after these images, so typically shortly after they leave the building. See this example that begins with a hole dream and then reaching the Pikachu after the thinking image. The thinking image can occur without they are together, but mainly it has been used as part of their walks together, and this will always be the case in the Pokémon story as they both are there if the moves are effective. See more detail in the Walking section. See this example that begins after walking past a three first and then later where Knit Cap Girl thinks before the next attack. See this example with the walking together image with Hairy in front. Pikachu uses a number of different moves, though these are mostly made up and are not from the Pokémon games. It is written as "Enemy Pikachu used "move", with the possible moves listed here below. This is included as the last image in this section, as it comes in between all these non effective moves. It can lead on as seen below. This will always lead on as can be seen at the bottom. "Super effective" when the opponent's type is weak to the attacking move's type. The examples below are marked with ¤ $ £ etc. and the moves are similarly marked to indicate in which examples they appear. Those that can be not very effective in a way that takes the characters past Pikachu are written in italics below. Those that can be super effective are written in bold below. A move that sometimes can result in a move past Pikachu will in another story line not give the same result. None of the moves have yet been shown to be able to get past Pikachu in both possible ways though! For instance the examples marked with "¤" and "&" below both uses graph theory and only in the first example is it super effective. But in the other it is not the last move. Abandonment ^[email protected] - Pikachu disappears completely. Anguish ¤%~ - Pikachu is sad. Ant Colony ~ - Pikachu is covered in ants. Nothing seems to happen, although Ethylene Dichloride is a toxic chemical, therefore there may be future consequences for the characters. Extrude + - Pikachu's head moves away from his body as his neck becomes long and malleable. Faceless [email protected] - Pikachu's face disappears. Friendship £= - Pikachu is on Knit Cap Girl's head, signifying they are now friends. Friendship, though not a move, is a game mechanic in the video games. Granite % - Pikachu is atop a block of granite. Ink Cloud %[email protected] - Pikachu is covered in ink. In the storyline Pikachu uses it, there is the option to "gather" the ink. Radicality £ - Pikachu is on a skateboard. Theft &@ - Pikachu wears Knit Cap Girl's hat. Pikachu seems to be using "Thief", a similarly-named actual move from the games, that is used to steal the foe's item and use it as its own. Uplift §@ - Pikachu's head goes upward, separated from its body, showing a long, thick cable still connecting the head and the body. Those two above are referencing the Google Maps: Pokémon Challenge. a reference to Twitch Plays Pokémon which was also covered by comic 1333: First Date. Cute face @ (Written out correctly as Enemy Pikachu used "cute face"). Cuteness % (Written out correctly as Enemy Pikachu used cuteness). (i.e. was it diluted as in the Ethylene Dichloride). Here are some examples of battle that together includes all the moves images. The examples below are marked with ¤ $ £ etc. Above the moves are similarly marked to indicate in which examples they appear. @ 9 different moves - including four user inputs and ending on theft (28 panels, record length although not passing all the way by Pikachu). = 2 different moves - ending both on Ethylene Dichloride and later on Friendship (26 panels, moving past Pikachu and then returning for another fight ending with the empty image for the user to fill in). + 3 different moves - including a user input and ending on extrude (20 panels, moving past Pikachu). § 1 move only - ending on uplift, and then followed by an empty image for the user to fill in (21 panels, not getting to the end, but only one here coming to Pikachu through a dream). ~ 5 different moves - including two user inputs and ending on ant colony (19 panels, not passing all the way by Pikachu). % 5 different moves - including two user inputs and ending on granite, and then followed by an empty image for the user to fill in (17 panels, not getting to the end). ^ 1 move only - ending on abandonment, and then followed by an empty image for the user to fill in (9 panels, not getting to the end). & 3 different moves - including a user input and ending on theft (15 panels, not passing all the way by Pikachu, and ineffective even though graph theory is also included before then end, which is effective in another example see below). ¤ 5 different moves - including two user inputs and ending on graph theory (24 panels, but no new text after poking the Pokémon). £ 3 different moves - including a user input and ending on radicality (22 panels, with one line of text after poking the Pokémon). $ 1 move only - ending on faceless (17 panels, but no new text after poking the Pokémon). Normally after a few failed attempts - where the result is given as It's not very effective, there is an uncomfortable silence as the Pikachu says "Um..."
They ignore this remark and walk away past the Pókemon. The Pikachu is left in the tall grass looking after them and has time to make a final remark which they also seem to ignore. After that they come out of the tall grass (without an image where they walk in the tall grass without Pikachu as seen below in the very effective version). Theft, on the ninth move! Ant colony, on the fifth move. Theft, on the third move. Extrude, on the third move. Ethylene Dichloride, on the first move! But first after burning the lap top. After this move they walk away only to meet another (or the same) wild Pikachu for another unfinished fight. "I used to be better at chemistry." "Wait I can install you BSD". "Come back! I don't like it here in the tall grass! ", see this example. "Wait you can't flee from a trainer battle! ", see this example. "No really guys I can still remember most of it", see this example. In another line out it says: "This is still better than all the lightning crap." See this example, where there is no follow up lines. There are several endings to this particular story-line, and in another story-line they do not meet the second Pikachu but lines are still spoken. Pikachu: Aren't you going to catch me? It's not difficult, I promise... Please? [Knit Cap Girl and Hairy ignore him and go away] and may get the following responses. Please! Jigglypuff keeps on drawing on my face! You were walking in tall grass! You asked for it! Please... Tame me! I want to party on days other than Thursday. Rarely, a suggested move knocks Pikachu out. But this image seem to always first come right after the one with It's not very effective which makes no sense, but is why this is also included here. The result is that Pikachu faints. Knit Cap Girl and Hairy looks at the fainted (not dead) Pikachu who lies facedown in the grass. Graph theory, on the fifth move. Radicality, on the third move, and with one line of text after poking the Pokémon. Hairy looking down the pit: Now. what? Faceless, on the first move! When leaving the building they may find a rocket on the lawn. The characters climb into the rocket. Note that Hairy can be seen climbing up the ladder in the second image and the door is slammed shut in the third indicated with small lines. In some story-lines the rocket does not launch. Either it fails or they just don't wish to go into space today. So the two characters climb out again. See this example where they then walk on and then have an argument. Note that after the door has been slammed there is an image without these lines indicating the door is now shut, before they climb out again. If they do not climb out again, the rocket will launch towards space right after the door has slammed without waiting for the picture with the door closed. Sometimes an image from the flight simulator program Kerbal Space Program (KSP) will then appear (see KSP theme) instead of the black image. See this example where the launch wakes up Knit Cap Girl from a (second) dream. (See the dream theme). See alto this example where the launch wakes up Hairy. If the characters doesn't wake up here, then the rocket will go into space (see space theme). Before reaching space a dark image will turn up. See this example where the space trip turns out to be a dream. Here another KSP image is also used to end the dream. The black picture is also used in the dream sequence with the hole just before wake up. This never seems to happen from the launch sequence. The black picture is also used in the dream sequence with the hole. After entering space, the rocket is always shown in an orbit over earth. From earth the rocket flies into deep space. These images will appear and reappear (sometimes several times) intermixed with those below. Exceptions are with those of the little prince and those after the attacking space ship which will always end the space journey. See this example with all the images from this section and the two from above as well as most of those below (several of them (many) more than one time). The first image is only used once right after Earth orbit. See this example where the first image is not included. See this example where the first image is used twice, but not to begin with. See this example where the image is used twice in a row. Passing Saturn with its majestic rings. See this example where the image is used eight times, but only for five flybys as the image is used both twice and three times in a row. It is the same question that appeared in 265: Choices: Part 2. If the question is answered satisfactory the two rockets will just fly past each other. See this example where the ship passes the space ship ones and then meets up with it again at the end. If the answer to the space ship is not acceptable it will turn around after passing, and shoot down the rocket. 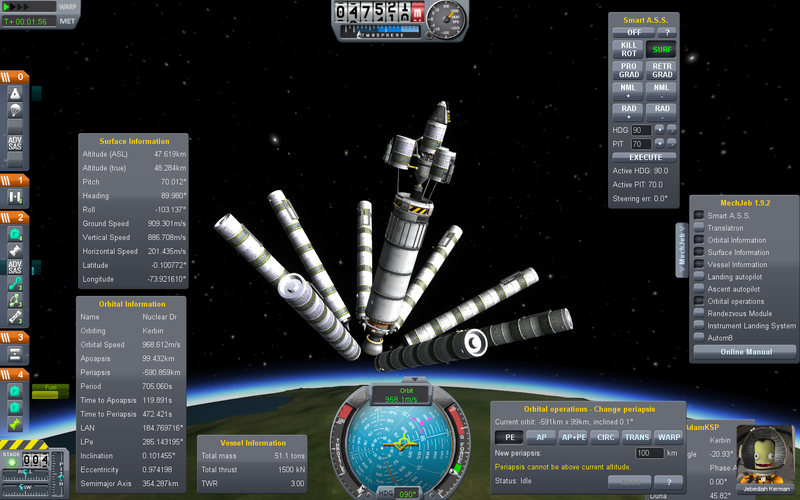 The next image is from the Kerbal Space Program (KSP) simulator, see the KSP theme. But in this case it is an image where the rockets are turned off as opposed to the one that could have appeared at the beginning of the launch. But that would not result in a space trip but in a dream. The KSP image is followed by Hairy waking up from a dream (it seems it can only be him), see the dream theme. In this example Hairy wakes up and starts to sing. 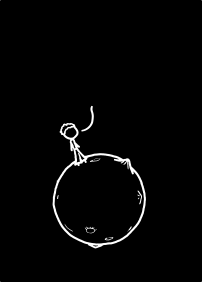 This is a reference to The Little Prince, which has been referenced before in xkcd in both 2: Petit Trees (sketch) and 618: Asteroid. See this example that stops at the first picture. The story originally never seemed to move past this first image with the prince and the rocket, but finally there appeared one more without the rocket. These pictures are from the flight simulator program Kerbal Space Program (KSP). The first shows a rocket with the engines on from rocket launch. The second shows a rocket with the engines off after the attack in the space theme. During rocket launch when the engine is on it turns out to be just a dream. One of the two characters wakes up in their bed. See this example where Knit Cap Girl wakes. See this example where Hairy wakes. It seems that the image can (no longer?) precede a space travel going into deep space. After the space ship attacks and shoots the rocket we see a KSP image with the engines off. See this image from KSP where the rocket engines are not on. After this image it turns out it was just a dream and Hairy seems to be the only one to wake from this dream. Sometimes, Knit Cap Girl or Hairy find themselves waking from a dream, suggesting that all prior events were just them dreaming. Others situations will only in some story lines lead to an awakening. In those stories there will always be another way to continue the story. Below are several situations, where a dream will or may occur, described (and shown with the full sequence leading up to the dream displayed). Either from the same dream. The dream scenarios (together with the meanwhile image) would make it possible to connect all images into one long sequence! This has not been seen yet though. Knit Cap Girl wakes up with her head to the left and the cap lying on the end of the bed. Hairy wakes up with his head to the right. One of the most obvious dreams is the one about falling as in this case where both characters falls into a big hole outside the building they are leaving. As shown here in this example where first one then the other characters awake from the same falling dream. The hole situation will always turn out to be a dream from which one (or either as shown above) of the characters wakes up from the nightmare after falling into the hole. But they can wake up after any of the three black pictures shown here. The other two pictures (which were not included in the first example) can be seen in this example with only Knit Cap Girl waking. A situation with only Hairy waking can be seen in this example. The total black picture is also sometimes used at the end of the rocket launch. A Dinosaur enters the comic (see more about these same images under the Dinosaur theme). When reaching the fourth image where the dinosaur steps on the building the story will always turn out to be a nightmare from which either of the character may wake up from. The rocket launch will not always turn into a dream. And this dream is not really a nightmare, as opposed to the three above, from which the characters always wake up. 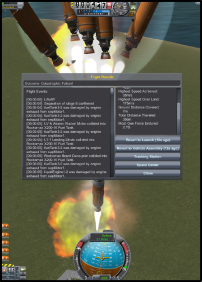 During take-off after the rocket ignites there are two possible images. If the last image is black then the take-off succeeds. But if the last image during take off is from the flight simulator program Kerbal Space Program (KSP) with the rockets on - see KSP theme they story always result in that either Knit Cap Girl or Hairy wakes up during. See this example where Knit Cap Girl wakes after she has already awoken once before from the hole dream. See this example and this example where Hairy awakes from the launch. During a space travel the rocket passes another space ship. If a failed communication occurs the evil space ship turns around and shoots down the rocket. At this point it turns out it was just a nightmare and one of the characters wake up (maybe only Hairy?). See this example that continues to a dinosaur dream from where Knit Cap Girl wakes up. In the last picture before waking we see an image from the flight simulator program Kerbal Space Program (KSP) with the rockets off - see the KSP theme. This situation will always turn out to be a dream. It is probably not possible that Hairy wakes up from this as he is not present when the debate starts. Sometimes, Knit Cap Girl or Hairy find themselves waking from a dream, suggesting that all prior events were just them dreaming. (See the dream theme). After they awake they stay in bed for a while and then go out in to the world. These scenes will be shown here below. Knit Cap Girl wakes up with a Gasp. She sits for a while. Maybe he even starts to sing, see below. After this she may either lie down or leave the bed empty. See this example where she lies back down again (and then finds a boomerang, see below). See this example where the bed is empty before moving on (twice yawning and with singing the 2nd time). Walk yawning into her office if the bed was empty (see below). Go out and find a boomerang if she lay down again. Hairy wakes up with a Gasp. He sits for a while. After this he may either lie down or leave the bed empty. See this example where he leaves the bed empty (and yawns and then Knit Cap Girl has another dream later). See this example where he lies back down again (and goes to meet the salesman, see below). Notice that Randall forgot to draw Hairy's hairy hair as he lay down again. If it was a wig, it should have hung over the bed like Knit Cap Girls knit cap does. Randall also forgot Hairy's hair in 1028: Communication, see this trivia. Walk into Knit Cap Girl at her laptop while yawning if the bed was empty, see below. Go outside to meet White Hat the salesman if he lay back down again. After having sat up in bed with a gasp either character may may then begin to sing I woke up like this. See this example with Knit Cap Girl (walkikng twice singing second time) where the bed is empty before moving on (both times). See this example with Hairy where the bed is empty before moving on . This is likely a reference to Beyoncé's song Flawless. The line I woke up like this is repeated eight times in the song, four time in each of the last to verses. Yawning Knit Cap Girl gets back to her laptop and we are back to the first image. See this example, where both characters yawning pictures appear after two times the same dream. See this example, where both pictures from this section appears and they continue to walk out after. After walking up with a gasp from a nightmare and then laying down again (without hair) he has chosen not to go to Knit Cap Girl. Which is why the laying picture is included here. Hairy takes an alternative route where he meets White Hat, a salesman with a small stand. White Hat tries to sell something to Hairy. Will he succeed? Here is an example where Hairy meets White Hat, but not reaching the graph picture. Here is an example that reaches the graph picture. Here is another example that reaches the graph picture. These two may be the only one two years after the release. After Knit Cap Girl awakes from a dream and then lies down in bed she may (always?) go outside to find aBoomerang on the ground. She picks it up and then always expresses her feelings about it in a thought bubble when she picks it up. But then it is always longer into the story and the second time she picks up a boomerang, with the first time proceeding after the dream as mentioned above. As just mentioned so may the first two boomerang images here also reappear, and hence also more than one accident can happen, even though they always stop the current run of throwing. She may comment on it again after catching it. She may also put it down and leave, but may then also find it or another boomerang again later. This is the cause for the longest story-lines almost always includes the boomerang. Since this only occurs after a dream, gives the longest stories, and never really gets on to any other stories (except a short story where Hairy walks alone), this has been placed last in this list. 445: I Am Not Good with Boomerangs. Knit Cap Girl throws the boomerang, and it flies back to her so she catches it. It may also fly back and forth above her. See this example where both are hit. See 445: I Am Not Good with Boomerangs. Knit Cap Girl then fails to catch the boomerang and the rebound hit Hairy in the face off screen and he then enters the frame in the next image. The boomerang crashes into something off panel - someone may shout back - and Knit Cap Girl runs away. In some cases this last accident is followed by the meanwhile image to make the story move on with Hairy walking along which is mentioned in more detail at the bottom of the Walking section. Leaving the boomerang on the ground without accident. Either the story stops before she completely leaves the image with the boomerang on the ground. Or she finds another and picks that up instead proceeding from there. See this example with both situations. Leaving the boomerang after hitting herself in the face. Running away after having hit someone off panel. This image seems to belong with the meanwhile image, and the storyline goes on using that route, so for sure away from the boomerang. Hitting Hairy off panel who then walks into the panel. there seems to be no story continuing from there. I.e. this story-line never leaves the boomerang behind, but just stops. And there used to be a sixth option "Gravity. Lots of it." However, it no longer appears. In one panel Hairy is drawn in bed without his hair - see the Waking up pictures. The most common pictures are "Not very effective", Throwing, Waiting, Leaving the House. The rarest pictures that can be found via permalink are The Little Prince, The beach, An exponential chart. As of late April there are several pictures from the complete list, that no longer seem to be available - so they are not only rare, but extinct in the comic if no one has a permalink to a comic where they appear. 2 pictures are listed as missing two years later on April 1, 2016, and they can be seen under themes where notices has made it clear where they are. It is the one with Hairy walking alone seen in silhouette and the one "after arguing" where Hairy is leaving that are missing. The other 147 images are all accounted for. This one has Chinese characters in it. Simplified, sadly. It would roughly translate to "The sentences have no meaning. With no meanings, there is nothing to say. How to arrange it into a haiku format then?" It is arranged in haiku: 5 syllables, 7 syllables, 5 syllables. In traditional Chinese characters it would be "句子没有意。意也没有話不話。怎麼來俳句？"
77 panels - Tiles, space/dinosaur double dream, boomerang, and exploding rocket. 46 panels - Tiles, hole dream, hole dream, boomerang, exploding rocket, bird passing. There may be no upper boundary! But this is then the list of the longest comics with most panels as found so far. Please note themes included in comic. Please move beaten records down and delete the fourth. Include only more than one if the story is clearly different from from the record. 77 panels - Tiles, two dreams one by each character, after space and dinosaur attack. 50 panels - Tiles, two times hole dream, boomerang, and exploding rocket. 41 panels - Politic debate, one dream about hole, boomerang. 36 panels - Tiles, two dreams, hole dream, blowtorch laptop, rocket take-off dream. 35 panels - Tiles, two times the same dream with big hole by the same character (shovel/blowtorch and then boomerang). 28 panels - BSD, one dream with hole that returns to starting point - does the dream continue? 26 panels - Tiles, two different dreams by the same character after hole and rocket. 22 panels - Tiles, two different dreams by the same character after hole and dinosaur attack. 41 panels - Politic debate, hole dream, boomerang. 35 panels - Political debate within a dream, then Hairy gets smacked in the face by the boomerang. 34 panels - Politic debate, as the 39 panel above, but here both the girl and then Hairy gets the boomerang in the face! 30 panels - Tiles, ending with the Little Prince and the rocket. 24 panels - Tiles, reaching the image with zoom in only on the Little Prince. 15 panels - Tiles, dinosaur dream, boomerang hits her in the face. 41 panels - Political debate, but also dream and boomerang. 36 panels - Tiles, hole dream, blowtorch laptop, rocket take-off dream. 28 panels - Tiles, quick to Pikachu, then very long fight with 9 moves none effective almost moving Pikachu talks only once. 26 panels - BSD, blowtorch and moving past the Pokémon not effective, Pikachu talks and they move on only to meet a second Pikachu. 24 panels - Refresh no new email, long fight very effective and Megan pokes it. 22 panels - Tiles, moving past Pokémon very effective and Megan pokes it. 22 panels - Tiles, indirectly after launch dream and only one picture in the ocean at the end! 13 panels - Tiles, hole dream, Hairy meets White Hat reaching the chart (last picture that way). These stupid tiles... I'll just play one more game: 77 panels. Oh. Hey. There's some kind of political thing going on: 41 panels. Let's see if BSD is any easier to install nowadays: 29 panels. Refresh... No new email... Refresh... No new tweets... Refresh...: 24 panels. Hurry! We're in talks with Facebook: 13 panels and also 13 panels but two different dreams. In the longest sequences many images repeat several times. This record could be more interesting than just which uses most images. Sadly this is rather tedious to check out but by saving the page and sorting other images from the remaining will only be there ones for every unique image. 48 unique images - 77 panels. 35 unique images - 36 panels (only the very first image repeated twice). 33 unique images - 50 panels. 29 unique images - 35 panels. 26 unique images - 41 panels. In the longest sequences many images has no choice but just a Continue. While other images have two choices in one. Count only the used choice, not the suggest a line in the last panel! 13 choices - 77 panels. 11 choices - 50 panels. 8 choices - 35 panels. 7 choices - 41 panels. I found a (possibly) bug where the comic doesn't load and there's just a comic-sized blank space. I've had the story loop back to the first frame, so it wouldn't surprise me if this could go on infinitely if it had the available dialogue options. Does everyone have these options in some order for the first tile? Oh. Hey. There's Some Kind Of Politicial Thing Going On. What about four transcripts - one for each of the four first original choices? Is the right politician = Cueball? You totally misunderstand me. I'm asking for an explain to every picture because it should belong to a former comic. Further more I'm just trying to keep the explain as simple as possible; individual error experiences should not be posted at the explain. I did remove that content in order to keep it simple as possible to an ordinary reader. Please improve the picture explains, but also please keep that explain simple as possible to readers are not interested on all that crap done by Randall. I got my suggestion as part of the main story! Are we sure the title is not related to http://en.wikipedia.org/wiki/Lorenz_gauge_condition ? Should there be an interactive comic category? This probably happens at the same time for all users, considering that I read 199.27.130.222's message immediately after he/she sent it and at that point the "stupid tiles" option had vanished for me as well, but this was clearly temporary since it's back now. Go home, Saturn, you're drunk. Why are the punctuation marks clipping? This page was last edited on 20 March 2019, at 12:23.